Unique technology for uniform compression! The DonJoy Surround Ankle Brace is recommended for additional stability following ankle sprains, strains and other injuries. The brace has no memory, and therefore prohibits pressure from being displaced to bony prominences. Semi-rigid shells help minimize ankle rotation and increase support joint to help prevent injury. Shop our complete selection of ankle braces or browse additional DonJoy products. Can I put this brace in the refrigerator or freezer? Will this brace give m as much support as an Arizona brace? Will this product help with ankle turning inward while walking? We recommend that you wear athletic shoes with your ankle brace. Is the Donjoy floam ankle brace recommended for wear during sporting activities or just as support while not playing sports? 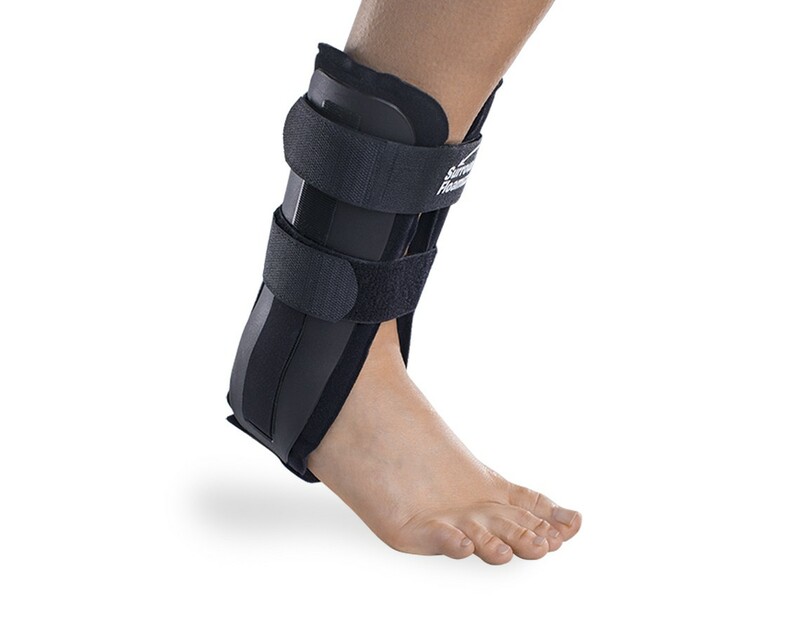 If you are going to be playing sports and need as much support as this brace provides you probably would want to consider the DonJoy Velocity Ankle Brace instead (https://www.betterbraces.com/donjoy-velocity-ankle-brace-23). The DonJoy Floam is a great supportive ankle brace, but it is not intended for vigorous court of field sports. So far this product has worked well. Ankle Sprain was borderline high ankle. Was relieved that I didn't have to wear a boot for a month. Pretty comfortable and keeps ankle supported and stable. Purchased these following ankle surgery. Needed support for my right ankle. These provide the support I need. Pros: Fairly easy to put on and fairly easy to fit inside my shoe. Cons: Haven't noticed any yet. I HAVE BEEN IN SO MUCH PAIN THAT I HAD TO USE A CANE TO WALK, WITH THIS BRACE ITS SO MUCH BETTER GOT IT TODAY!!! THAT'S THE WAY IT SHOULD BE, SO THANK YOU AGAIN AND I'M ORDERING A SPARE LOVE MY ANKLE BRACE!!!!! Underside is hard plastic, uncomfortable. While the upper part of this brace is well designed, offering good stability, I was unable to bear wearing it for more than an hour as the arch of my foot hurt so bad from the brace. It should be soft under your foot to allow your arch to mold to the shoe you are wearing. Terrible was of money!! I love this brace. It serves me well. I am able to walk without a cane. This pleases me.